Perfect for any occasion, weddings and parties or as a gift. Organza gift bag included! 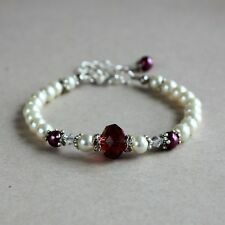 Burgundy, cream, clear crystal, silver. Silver plated lobster clasp and extension chain. 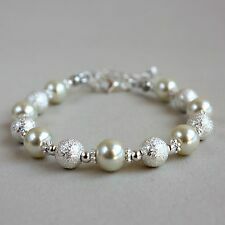 A contemporary beaded bracelet featuring ivory/cream faux pearls and bright silver plated stardust beads. Perfect for any occasion, weddings and parties or as a gift. Organza gift bag included! Ivory/cream, silver. Perfect for any occasion, weddings and parties or as a gift. Organza gift bag included! Ivory/cream, light grey, clear crystal, silver. Silver plated lobster clasp and extension chain. Ceramic style beads gold plated link bracelet. Ceramic style beads and alloy. Cream and gold plated. A contemporary beaded bracelet featuring ivory/cream faux pearls and clear glass crystals. Perfect for any occasion, weddings and parties or as a gift. Organza gift bag included! Cream, clear crystal, silver. One aqua blue fabric covered with one cream bangle set. Double Bracelet Bangle set. Width of each bangle - 1.5cm. made with love by. We will always help you to have a 100% positive happy buying experience. A contemporary beaded bracelet featuring ivory/cream faux pearls and sparkly rhinestone spacers. Perfect for any occasion, weddings and parties or as a gift. Organza gift bag included! Ivory/cream, silver. Made with thick craft elastic (1mm), acrylic blue oval shape and round cream with brown veins, beads. Blue Bead = 7mm x 5mm. This is lovely Danish Lucite Brass cuff bangle. Get Images that. Width: 1.2cm (approx 0.50"). Ladies / mens 5mm cream nappa leather & stainless steel bracelet - Lyme Bay Art. Each is made up of a single strand of chunky pearl effect beads. Although are imitation have a lovely rich look. No clasp as stretch enough to go on over the hand. Miss Selfridge Pearl Hairband. Miss Selfridge. Cream Hairband. Makes Cute Bracelet. Pearl Detail Charms. Ladies 5mm Light Cream nappa leather & stainless steel bracelet by Lyme Bay Art.